I LOVE black and white photos. I love the simplicity. I wish I edited and printed more black and whites, but it’s often things like the color of fall leaves, the perfect shade of pink on my daughter’s outfit, or my son’s beautiful blue eyes that pull me to color. But honestly, I think when one really studies a black and white photo, it’s amazing just how ‘colorful’ it is. Especially on a photograph where there is much texture. Who knew there were so many shades of grey between a true back and a true white? My ‘Black and White’ for the challenge was taken on Delaware Avenue in downtown Buffalo, NY. I had no particular subject in mind, but as mentioned above, I knew I needed texture to get the contrast in the ‘color’. 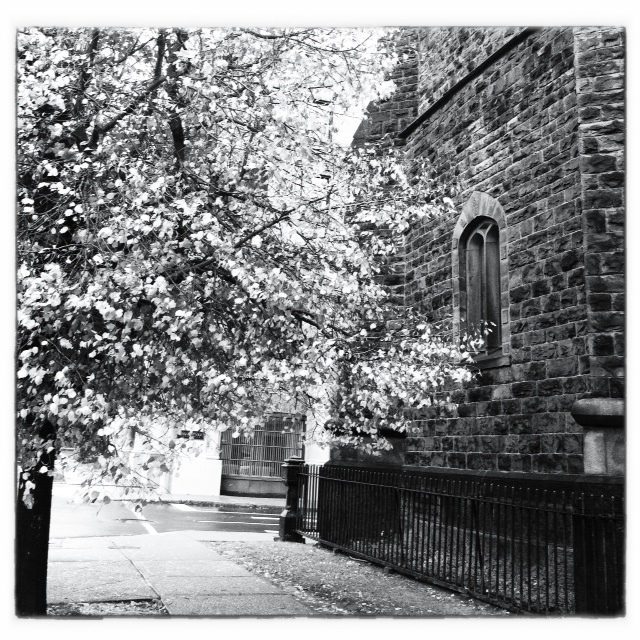 I have always loved grand architecture in black and white, and when I saw the wonderful stone Church, glistening streets, and dark wet bark on the tree with yellow soft leaves, I knew I had it. For this challenge, the entire edit was done on Snapseed. I cropped to a square and auto corrected color and contrast. I then tuned it up with brightening (the clouds are still looming in western NY), added even more contrast, and then sharpened the details. To finish, I chose a neutral black and white, brightened it once again, and then framed. I found today’s challenge more difficult than I had anticipated, for I absolutely love black and white photographs. I figured out that the reason for this is that I don’t as a general rule take pictures with the intention of converting them to black and white. When I look at my downloaded photos, it usually strikes me then whether or not they would be better monochrome or in color. So this daily challenge was a wonderful learning curve for me. It taught me to look for textures and shades within the available light. 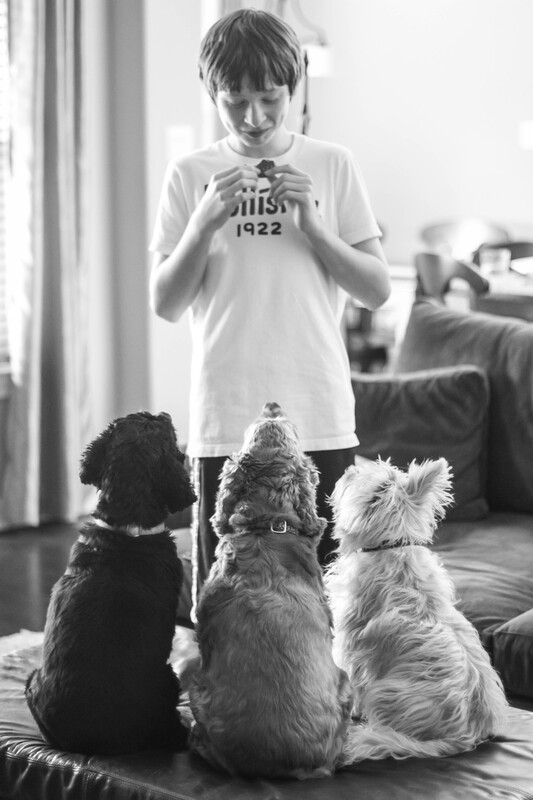 Jack is my middle child with a wicked sense of humor and a deep love for our 3 dogs, Chewie, Millie, and Gimli. Perhaps only more dear to his heart is his famous love of chocolate. Here he is teasing them with a morsel of goodness and trying not to laugh at their rapt expressions. I love that the different colors and textures of the dogs coats stand out, that my son’s dimples are obvious, and that the image is timeless. The picture was taken in the family room at the back of our house at around 4:45 in the afternoon. It was overcast and raining outside so the room was pretty dim. Therefore I set my ISO at 1600 and my shutter speed at 1/50. My aperture was f/1.4 but because the dogs were sitting in a row they were still all in focus, and my lens was wide open to let in light. I converted the image to black and white in Lightroom, then increased the exposure and contrast. I decreased highlights and increased the shadows, increased the black clipping and the clarity, and finally sharpened and smoothed the luminance. Awesome pictures again…ladies, you are both very talented!! Love this photo Alex! Those dogs are so adorable!